Art Fairs and Trade Fairs. An ambitious artist might be interested in exhibiting at trade fairs or art fairs. 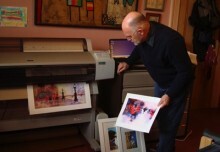 These are usually annual events lasting just a few days where the artist shows a collection of their work to visitors. The costs can be quite high for a stand space but the rewards can really pay off. There are two main kinds. 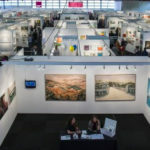 Trade fairs focus on trade buyers who will buy at trade prices to resell, and art fairs that admit the public where collectors pay full retail price. Here in the UK we have had the very successful Spring Fair held at the National Exhibition Centre in Birmingham every year since dinosaurs roamed the earth. What! You haven’t heard of it? Most people haven’t either. But it is huge. It fills the NEC and lasts for days and days. Plus set up and take down of course, so it lasts for well over a week. At the NEC that is massive. The reason that you might not know about it is because it is a ‘trade only’ fair. It covers the international gift trade as a whole. That includes pots and pans, knives and forks, cushions, ceramics, fashion, jewellery, luggage, framing, wholesale, etc. The art part is quite small in comparison to all the rest. But it is not open to the public. It is ‘trade only’. I first exhibited at the Spring Fair even before the NEC was built. The fair used to be held in Blackpool and was scattered in different locations all over town. The art section was in a converted multi-story car-park. And as you know multi-story car-parks do not have heating, so it was cold. Even worse, we were exhibiting at the time that the three-day week was forced onto the British populace. We had hardly any lighting, just a few hanging light bulbs, and so we showed our art products to any visitors by the light of a couple of torches. But we sold our art to buyers from Japan, the USA, and all over the UK. But I digress. That was ages ago. Nowadays the Spring Fair is a very big event for the gift trade. It comes just a few days after the Christmas and New Year Sale periods have emptied the high street shop shelves. Well that’s the theory anyway. The art section used to be much bigger than it is now. It had a whole hall just for art. However the art business world has changed. Now the art, framing, and greetings card sections are allocated in part of a hall. Hey-ho sigh! This similar to the Spring Fair. Held in September at the NEC. But a bit smaller than the SF. Still ‘trade only’, so not open to the general public. This is open to the public. And it has actually shown affordable art to 2.3 million people since it first opened in 1999. That first show was in Battersea Park in London. Nowadays the Affordable is held in 10 cities all over the world, including New York, Amsterdam, Hong Kong, Hamburg, Brussels, Singapore, Milan, Stockholm and Bristol. I have shown at many Affordable shows with success. But there is a snag. They have a top price. You cannot show and sell work over a certain price limit. In fact the organisers have managed to create a super showcase for rising artists doing originals under the price ceiling. So their rules have paid off for visitors. Not so good if you are selling art that is going up in value above the limit. Another snag is that the Affordable has favoured gallery and dealer exhibitors rather than individual artists. This is because galleries can and will show a continuing variety of artists, whereas an artist would want to show their own work over and over again. 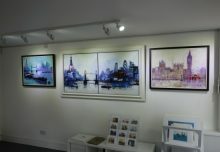 Galleries and art dealers therefore will be repeat exhibitors with a good supply of new product. Artists might not. So an artist who is showing at the Affordable is going to be getting only the artists percentage after the gallery or dealer takes commission. And the commission will be high because the fair is not a cheap place to exhibit. There are other art fairs of course. An ambitious artist might consider showing internationally. I have shown in fairs in Germany and the USA. The extra cost involved can be very scary. At least I could speak English at the New York fairs when I took a stand. In Germany it was a bit more of a problem. Another International opportunity where they do speak the same language is the Edinburgh Art Fair. I have shown there as well. But as a guest artist with a gallery. The Brighton Art Fair is my local fair. The fair organisers seem to prefer individual artists to take the stands. The spaces are small and not too expensive so this fair is a definite possibility for an ambitious local artist. It has been off for a while as the Corn Exchange venue has been going through a big uplift. The fair is returning in September 2019. Hmmm? Maybe! An aspiring ambitious artist can do themselves a lot of good if they explore and research the trade and art fair possibilities. My advice is always ‘go and see the fair before thinking about exhibiting’. That means taking a long view. The costs are big and the risk is too much. How to get into galleries.